Last night we were surprised and proud to win the Design Museum's Design of the Year award. That picture sums up what I want to say. This is not just a win for GDS, this is a win for everyone across government. In that picture there is a fraction of the team who have worked on this at GDS: designers, content editors, developers, product managers, operations, strategy, engagement, and project management people. There's the Minister for Civil Society, Nick Hurd, and Rohan Silva, Senior Policy Adviser to the Prime Minister. Pippa Norris from Ministry of Defence, Roger Oldham from Ministry of Justice and Adam Bye from the Foreign and Commonwealth Office. There's also Margaret Calvert (who designed the UK road signage system in the '60s) and our little award. You can't design in isolation and you can't build a site like GOV.UK without working in truly multi-disciplinary teams across all of government. Thank you to everyone who has worked on this. Last night lots of people were asking, "what does this mean". It means two things: firstly, that the civil service can deliver ambitious, world-class digital projects at scale. Secondly, it will us help recruit the design and digital talent we need to start building digital capability right across government. 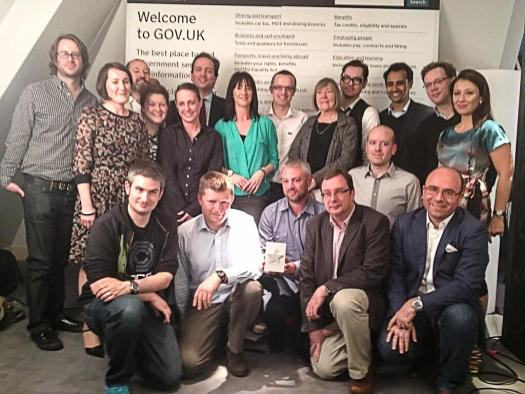 Six months ago today GOV.UK moved out of beta, yesterday we released the Government Service Design Manual and today DWP became the 21st ministerial department to move over to GOV.UK. There's lots more work still to do and we continue to be focused on designing services so good that people prefer to use them. Read more about reactions to the award on Storify. Hi I'm interested in website design and particularly usability, and I think gov.uk is really impressive. I would love to learn about the underlying technology from a usability point-of-view. Can you help me? It's a fully justified award for superb work, from everyone involved. Massive congratulations to everyone. What a bonkers year! Congrats to everyone at GDS - keep up the good work! Well done. It's rare for a public sector team to get such an award.